Would you like to quickly find out more about the people you email with? Here’s how the Outlook Social Connector can help you stay informed and connected without wasting hours on Facebook. While Facebook and other social networks are often considered a great time waster, they can also be useful tools for staying in touch with family and friends and knowing what’s going on in their lives. Plus, it’s one of the best ways to find out more about someone; who hasn’t looked up someone who emailed you on Facebook to see who they really are? The new Outlook Social Connector integrates your favorite social networks seamlessly into Outlook, so you can see your contacts picture and recent status updates without leaving Outlook. We’ve already looked at the LinkedIn connector, so let’s look at how you can use the more popular Facebook with it. 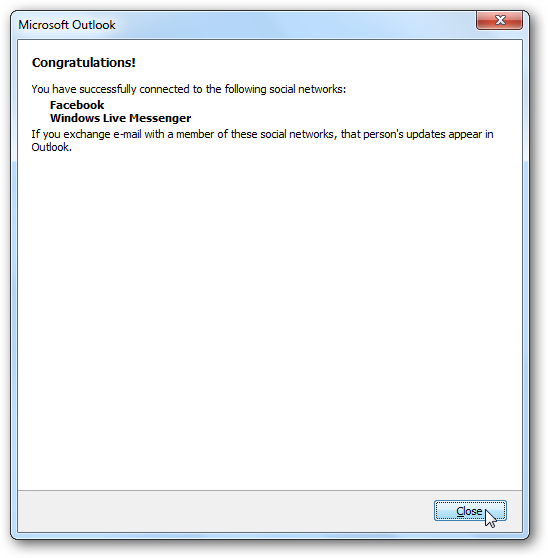 If you’re running Outlook 2010, you’ve already got the Outlook Social Connector installed. The Connector was recently updated, however, so be sure to check Windows Update and install the latest update if you haven’t already. 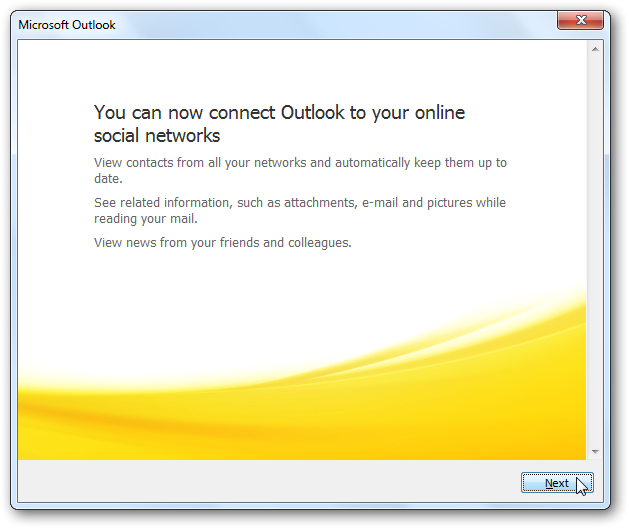 If you’re still using Outlook 2003 or 2007, don’t despair; you can still use the Outlook Social Connector too! Head over to the download link below, and install it as normal. 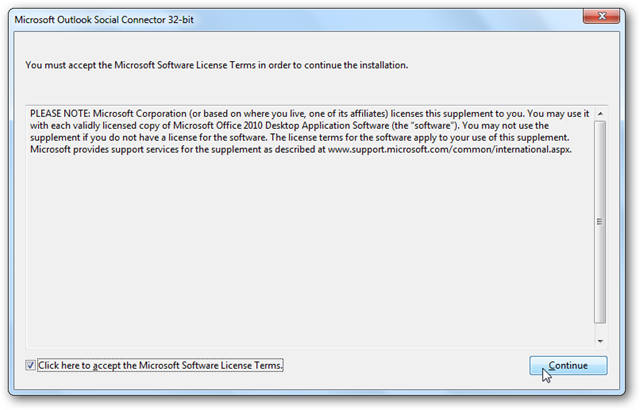 The installer makes it sound like you can only use it with Outlook 2010, but the download site from Microsoft promises you can use it with Outlook 2003 and 2007 as well. Now, the next time you open Outlook, you’ll be prompted to add social networks. Click Next to start setting them up. 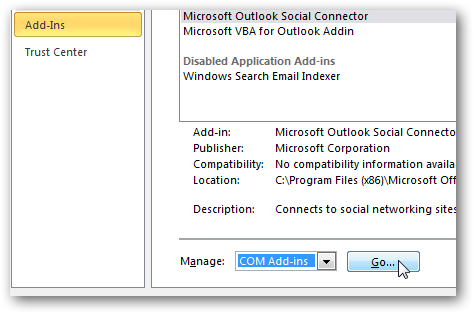 Or, if you’ve already had the Outlook Social Connector running but hadn’t added social networks, click on the link at the bottom of your emails to get started adding them as above. Now, you can add one of the pre-installed connectors or click the link to view more providers online. 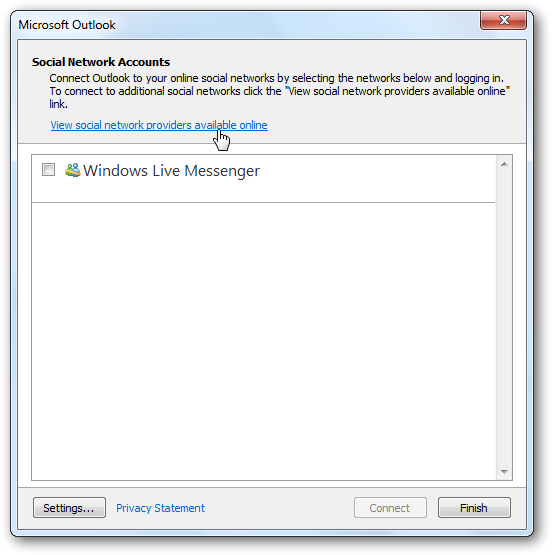 The new Windows Live Messenger adds a connector by default, but if you want to add Facebook, LinkedIn, or others, you’ll need to download a connector. On the Connector website, select the network you would like to add. We’re going to add Facebook, though feel free to add any or all of the networks, depending on what you use. This will send you to a download page on Microsoft Downloads. Select the x86 bit version for most versions of Outlook; if you’re running the 64 bit version of Outlook 2010, then you can select the x64 download instead. Once it’s downloaded, install the connector as you would any normal program. You don’t have to close Outlook to install the connector, but you will need to restart it before you can add your Facebook info. Note that when you exit Outlook, it will ask if you wanted to add a social network. 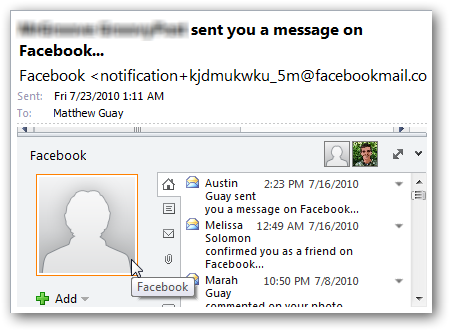 Click Remind Me Later, then restart Outlook so you can add your Facebook info. Now, when you go to add a social network as above, you’ll see Facebook listed as an available social network. Click the check box, and then add your Facebook account info. 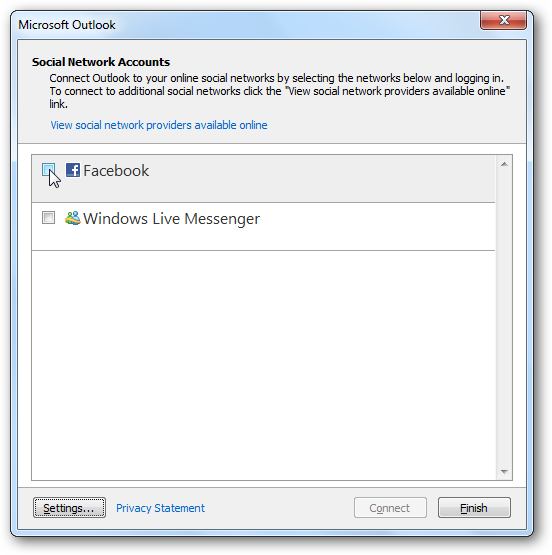 If you want, you could also add Live Messenger to see updates from your friends on Windows Live. Click Connect at the bottom to continue. After a few moments, you’ll see a confirmation that your networks are connected. You can click the document icon to change settings if your accounts didn’t connect correctly or you need to change the password. 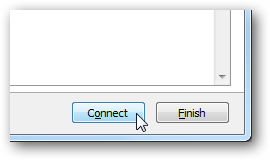 Once you’re finished, click Finish at the bottom of the dialog. Outlook will congratulate you on connecting your social networks; just close this box, and you’re ready to start staying more connected through Outlook. Once you’ve integrated social networks with Outlook, your emails will tell you a lot more about your friends and colleagues. Whenever you open an email, Outlook will automatically find and show you your friend’s recent status updates, pictures, and more from Facebook, as well as emails you’ve recently sent and received from them. 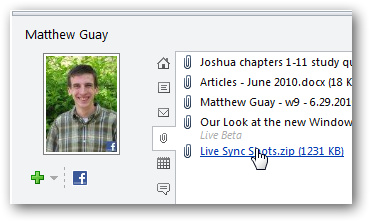 You can click on a picture from a friend’s updates to open it in Facebook in your browser. Group emails will be especially interesting, as you’ll be able to see information about everyone listed in the email. If you’d like to add a contact as a friend on Facebook, click the Add button and then select Facebook. Click Continue to confirm that you want to add this person as a Facebook friend. This is much easier than trying to find a contact from Facebook’s search page. However, if you receive an email from Facebook, Outlook will show you recent emails you’ve received from Facebook rather than updates from the friend that sent you a message or post. This is because Outlook is looking up information from the sender’s email address, and messages from Facebook are all sent from an automated service rather than from your friend’s account. The Outlook Connector also helps you stay in touch with your emails better. You can see all the attachments and emails you’ve sent to or received from a contact. This is a great way to find that report you misplaced or to remind yourself what you were emailing about last week. Explore the different tabs in the Connector to find even more about your contact. 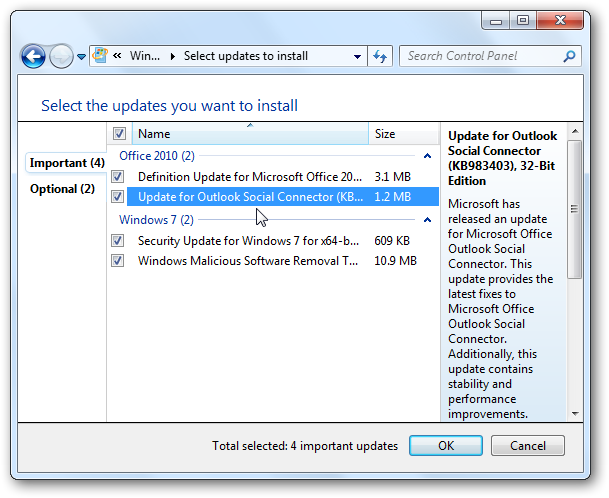 If you didn’t find the Outlook Social Connector useful at first, you may have disabled it. You’ll need to re-enable it to start seeing Facebook updates and more in Outlook. 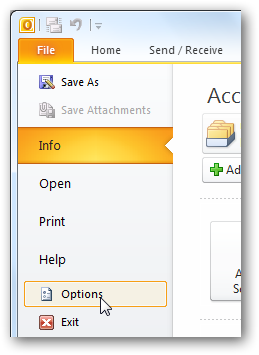 Open your Outlook settings; in Outlook 2010, click the File menu and select Options. Select Add-Ins from the options on the left, then select Com Add-ins beside Manage and click Go. 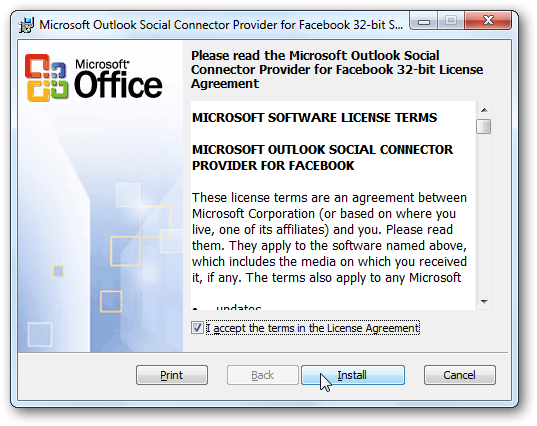 Check the box beside Microsoft Outlook Social Connector and click Ok to re-enable it. Now you can add social networks as above. Whether you’re addicted to social networking or just use it since all your friends and family do, the Outlook connector is a great way to know what’s going on with your friends without having to stay on Facebook all the time. Since it can also show related emails and attachments, it may even make you more productive in Outlook, too!